In 2017 has been manufactured yacht Hanse 415 called Talia. She is placed in port Puntone in the area of Elba And Tuscany in Italy. You can board up to 6 pax on the yacht Talia. Arrangment of berths is 6 +2 in dinette. There are 3 bedrooms placed under she's deck. Talia has 2 bathrooms. See more boats by going to this section: Yacht charter Elba And Tuscany. Tank for fuel is 160.00 l liters big , water container has up to 520.00 l liters. In this yacht there is motor 38. 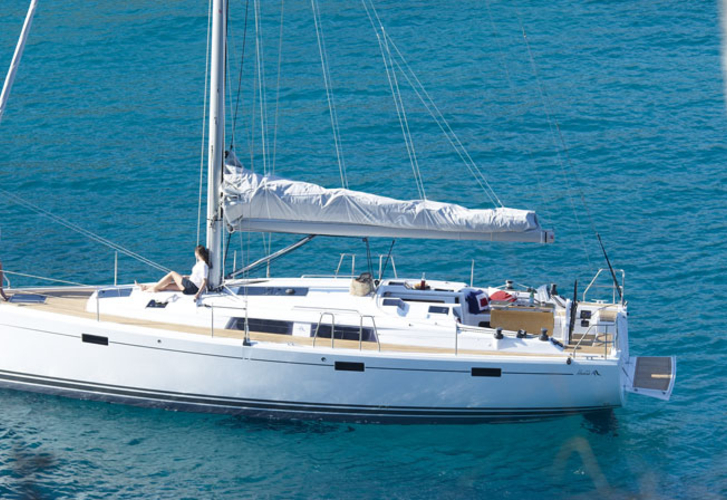 With 12.40 m of LOA and 4.17 m of width Talia provides enough space for comfortable sailing. Hanse 415 Talia is equipped with: Autopilot, Gps plotter, Bimini top, Anchor electric windlass, Teak cockpit, Dinghy, Radio / cd player, Mainsail with lazy jack, Self-tacking jib . . Caution is 1800.00 EUR. Search for different boats by clicking on this link: Yacht charter Puntone.